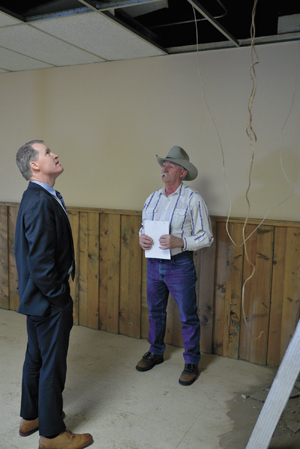 With an ailing Taber Agri-Plex suffering from a deteriorating roof and outdated bathrooms, the Taber Exhibition Association (TEA) has secured a $350,000 debenture from the Town of Taber to upgrade the aging facility. TEA president Frank Kast, vice-president Josh Iwan, and office manager Amanda Valgardson headed a delegation to town council’s Feb. 26 regular meeting requesting council’s consideration of assistance with a roof and bathroom project in 2018. In 2014, the facility’s original roof was re-screwed, with the expectation that the existing roof would need to be replaced within five years. The Taber Agri-Plex was constructed in 1983. The TEA has secured a CFEP grant of $121,795 and has a current bank balance of just over $100,000. Through the repayment schedule, the TEA would make payments twice a year for the next 20 years, with dual payments of $24,053.26 in June and December. Total interest paid after 20 years would be $131,065.20. Following discussion, council voted unanimously that in accordance with the existing lease between the TEA and the Town of Taber (Sec. 5: Additions, Alterations, or Renovations) it authorizes the Agri-Plex Building Roof and Bathroom Project scope of work as presented. As part of the same motion, council also received the request for funding for the Agri-Plex Building Roof and Bathroom Project from the TEA and authorized a debenture from town reserves in the amount of $350,000 over a 20 year amortization period at Alberta Capital Finance rates. And further, council considered the TEA’s request for waiver of permit fees to a maximum amount of $7,300, of which the town would relinquish its proposed revenue, while still forwarding the applicable 50 per cent fee amount to Superior Safety Codes, to come from town reserves.